Last night, I pulled the power cord as I needed to be "mobile between my recliner and my office" with the laptop. back to the recliner again, and I just up and closed the lid, and laid the laptop down like I always do. it is never powered off, just close the lid. Well, after my night time required ZZZZZzzzz session ended, I get the laptop, open the lid, and "NOTHING???" yes, I got a whole lot of errors in the file system, as the reboot went thru and fixed things. 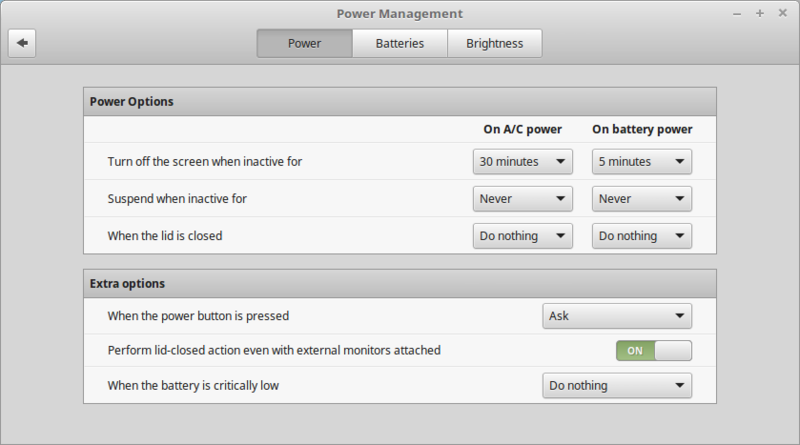 and read that in Cinnamon, some Power Management options have been lost.... shutdown being one of them. so, I installed the Battery Monitor applet and remember having done that before, but it got lost along the way with my experiments in trying different OS versions. Do nothing is the only option I have. That thread says nothing about lost Power Management options - the OP in that thread just wants a more in your face low battery notification than the default one which is very innocuous and isn't very reliable. It used to be eons ago, have not thought about it at all, until that thread came up, about the Battery Monitor. I installed that fix, but it obviously did not fix the AutoShutdown on Critical Battery. Don't think anything unusual is in Grub, except for trying to make USB mouse AutoSuspend work, which so far, is working, thanks to you. GRUB_CMDLINE_LINUX_DEFAULT="ipv6.disable=1 usbcore.autosuspend=-1 enable_mtrr_cleanup mtrr_spare_reg_nr=10 mtrr_gran_size=32M mtrr_chunk_size=64M"